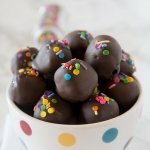 I make truffles for Christmas every year. They are a sinful treat that I love, and they always impress. I always make a few packages to giveaway as gifts. I usually stick with a few classics…mint, armaretto, and plain chocolate. This year though, I am changing things up a bit! I will still make the tried and true ones, but I am throwing a couple new ones in there. I love cookie dough, who doesn’t? My in laws are coming this week, and my father in law just might like cookie dough more than I do. So I knew I just had to make these for him. These definitely do not disappoint! 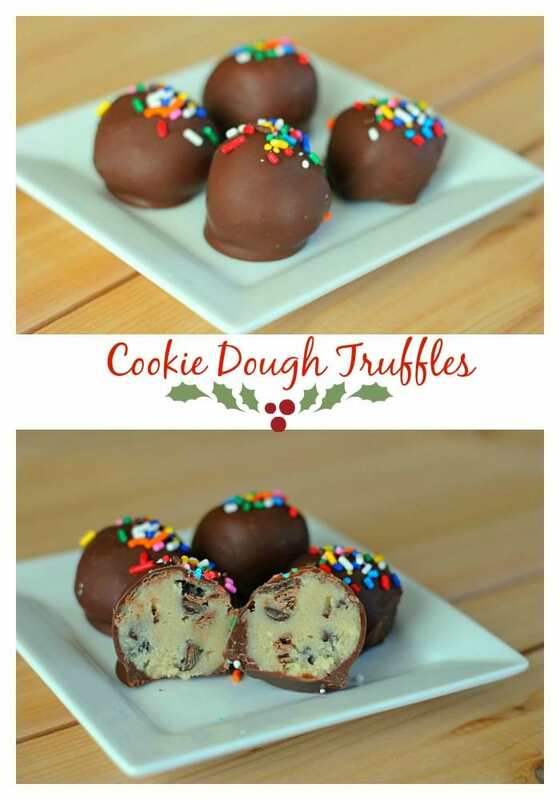 If you like cookie dough, you HAVE to make these! They are egg free, so there are no worries about eating raw dough. 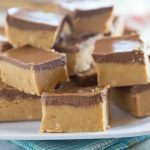 It is a good thing I put a giant portion of these in the freezer right away, because they are really hard to stay away from! This recipe is very easy. You can follow this one, or if you have a favorite dough it is very easy to adapt. Just omit the eggs, add in some milk for moisture, and you are ready to go! 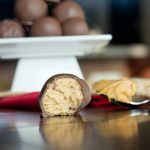 Peanut Butter Cookie Dough Truffles anyone? They would be amazing too! In an electric mixer, beat together butter and sugar. Add vanilla. With mixer on low, slowly add in the flour, until completely incorporated. It will be very dry, that is ok. Beat in milk until well combined. Stir in chocolate chips. Cover and refrigerate for about 1 hour. The dough should be very firm. 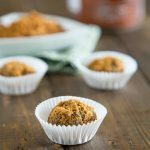 Using a small cookie scoop, scoop out dough and roll in hands to form balls. Place on lined baking tray. Refrigerate again for at least 30 minutes, or until you are ready to dip. 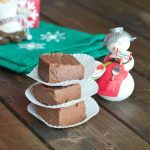 Melt chocolate in microwave or using a double boiler. Dip dough into melted chocolate. Place on lined baking tray. Decorate with sprinkles, colored sugars, chocolate chips etc. Allow the chocolate to fully harden. Store in air tight container in the fridge. Hello, very interesting … but the base is not cooked? Do not you feel the raw meal? Those look completely addicting. 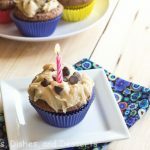 What a fun treat for your FIL and everyone else for that matter! Yum! I love these! I made these awhile ago and they are sinful 🙂 Thanks for sharing! 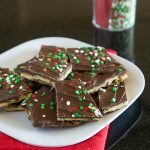 This is one of my favorite holiday treats!! yummy! These look absolutely delish. I would want to eat them up all by myself. Oh my goodness, these look amazing!! I have so much to do this week before Christmas but I’m totally finding time for these. Yum! Awesome recipe! These gems are definitely the ones you want to serve by themselves and serve them last. 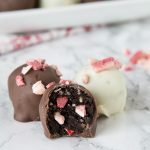 If not, your other holiday goodies will probably be ignored and you will be faced with questions like why didn’t you make any more of these truffles-I barely got to taste them! I need to label the recipe with a note-“warning: this is highly addictive and has elements that can result in euphoria” Well done Erin! Truffles are the best and I don’t think it gets any better than these with cookie dough, yum! Beautiful and so delicious looking! Well done Erin!! 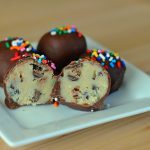 I love cookie dough so cookie dough truffles are such a no-brainer! Love these! 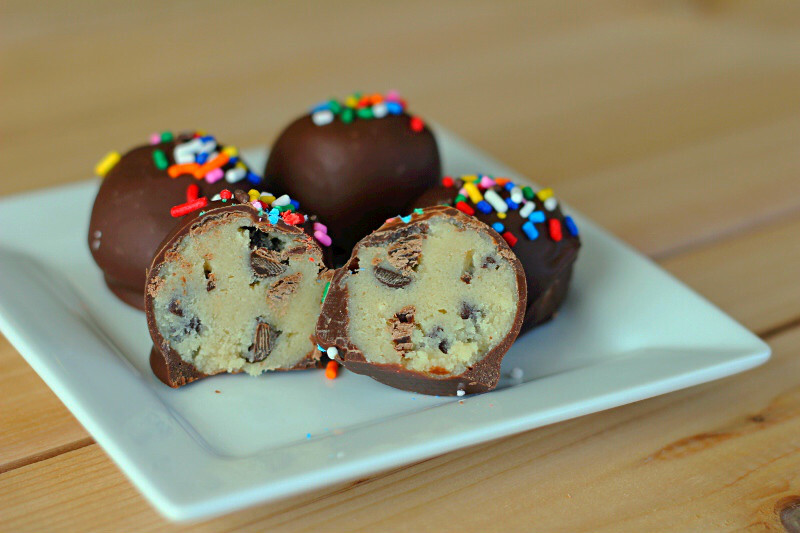 I had never heard of cookie dough truffles before but would love to try these. They look addictive! Dangerous is the only word I can describe these as…and I cannot wait to try them out. I think this could me a last minute Christmas present for my husband. I looooveee me some cookie dough so I am really loving these!! So going to make these soon! I bet these were amazingly popular with everyone! If they were in my house – my family would be sneaking them every chance they got! 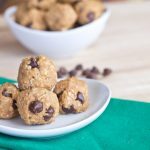 Who doesn’t love cookie dough, and not getting sick is always a bonus to eating it! This is such a great gift. I’ve got a holiday party to go to and since our hosts don’t drink wine, I think I may try this for a hostess gift. Thanks for sharing! Ramona: I doubt you would feel the meal. I remember as a child stealing the cookie dough and even now have to have a bit of it. Using the milk instead of egg will result in the same type of smooth texture. Ooo yum yum yum. I made cookies at the weekend and picking at the dough while I was rolling them out reminded me how good raw cookie dough is! I must make these soon. Oh Erin, those are just perfect. I want to reach through my screen for them. How did I miss these? 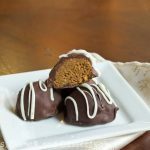 Maybe I’m glad I did…as I’ve made my truffles…which I can resist. Cookie dough, on the other hand, I can’t. 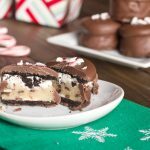 I’m making these next year for sure! 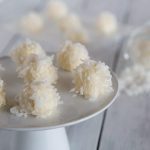 These look so very amazing 🙂 What better to make a truffle version of? Im catching up on my inbox – I swear! 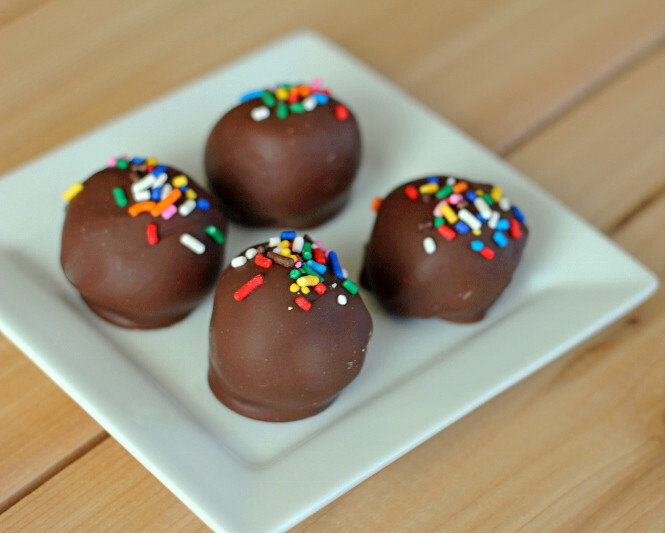 I love the little sprinkles on top of these tasty truffles – its adorable. Did you get lights for the holidays? I am dying to know. I did!! I am not sure what kind though, I haven’t played with them much. Hi, I just wanted to let you know that for Valentine’s Day, I made a variety of truffles for my office. 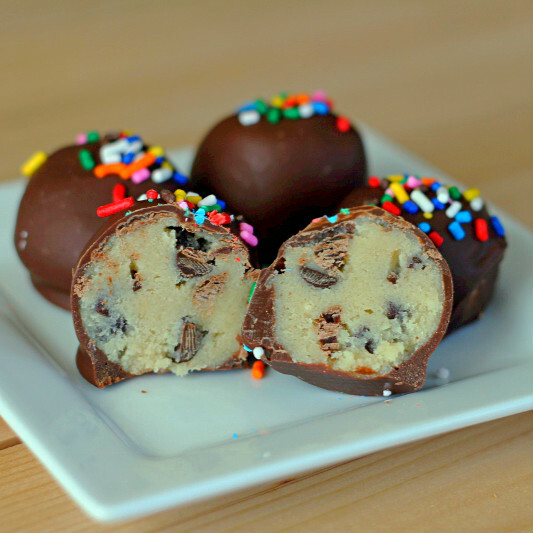 Your Cookie Dough Truffles was the absolute HIT of all of them. Lots of staffers and faculty absolutely raved about these. I used mini-chips, and I need to perfect my dipping skills, but your recipe worked wonders. Thank you so much! I am so glad everyone liked them!